Because these 4 actions (CRUD) are so common, Rails includes the scaffold command to make creating them easier. Now is a good time to figure out how to have multiple tabs or windows of your terminal or command prompt. Starting and stopping the Rails server all day is tedious, so it's good to have one terminal tab or window for running commands, and a separate one for the server. 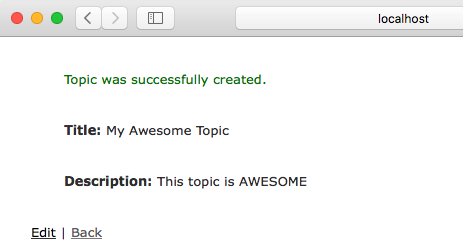 Fill in the form and click "Create Topic"
You've created a basic database driven web site, congrats! How did all those pages get created and hooked together? The Rails scaffold did it for you. This file contains code for our topic model. If you look at it, it's nearly blank. Creating, reading, updating, and deleting records are built into Rails. This folder contains all the views for our topics model. This is where the code for the forms you used above is stored. Rails created all of these pages as part of the scaffold. If you've written HTML before, many lines in the views should look familiar. Rails views are HTML with some extra code added to display data from the database. This is the code for the page that lists all the topics. Index is the name given to the "default" page for a web site or a section of a web site. When you navigate to http://localhost:3000/topics the topics index page is what is sent to your computer. This is the page you get when you click the "Show" link on the "Listing topics" page. This is the page you get when you click "New Topic". This is the page you get when you click "Edit". You may have noticed that the page for new topics and the page to edit topics looked similar. That's because they both use the code from this file to show a form. This file is called a partial since it only contains code for part of a page. Partials always have filenames starting with an underscore character. Challenge question: Can you find the line of code in new.html.erb and edit.html.erb that makes the form partial appear?